Scoping out the best deals on gear this Cyber Monday, and the rest of Cyber Week? Your first stop should be sweetwater.com! Starting right now, you can get huge discounts and promotional financing on the biggest brands. We've trawled through the site to locate some of the most eye-popping deals, but more will be rolling in through the week, so check back on the sale page daily to make sure you don't miss out! Below, you can check out some terrific deals on everything from PRS' beautiful SE Angelus acoustic, to DigiTech's versatile SDRum auto-drummer pedal to Line 6's amazing POD HD500x Guitar Multi-Effects Floor Processor. The Line 6 HD500X Multi-Effect Processor is a beast in every sense of the word. Featuring more than 100 different types of effects, the HD500X covers pretty much every conceivable sound a guitarist could want. It also offers 30 HD amp models, which include multiple channels of classic amps (rather than just a single “best of” model of each amp) and even a number of uncommon classics. Aside from all that though, the HD500X is a powerful command center that also functions as a MIDI controller, the brain of a Line 6 Link system and even an I/O device for digital audio recording. Best of all, for Cyber Week, you can save $100 on this powerful, incredibly versatile machine by pointing your browser right this way. PRS' SE acoustics perform well beyond the usual standards of other acoustics in their price range. Delivering terrific dynamics and sweet, intricate harmonics, the SE acoustics perform at levels comparable to much more expensive boutique instruments. With Sweetwater's incredible Cyber Week deal on the SE Angelus A270E — a $949 guitar, available now for $598 — you can get elevated performance for an entry level price tag. This Cyber Week, Sweetwater is offering 15% off on literally hundreds of pedals courtesy of everyone from Earthquaker Devices to Morgan to Wampler and more. The Guitar World Platinum Award-winning EarthQuaker Pyramids Stereo Flanger—an essential addition to the arsenal of any flanger connoisseur or a perfectly strong first flanger for any guitarist—is just one of the pedals whose prices have been given a healthy, tantalizing cut for Cyber Week. You can start saving, and examine the full list of discounted pedals right over here. Postive Grid's Twin pedals are terrific little machines, allowing guitarists to get an incredible array of tones from their instruments at reduced prices. The Modulation Twin pedal (pictured above), for instance, features nine factory-based modulation presets, five control knobs (Depth, Intensity, Tweak 1, Tweak 2 and Rate), plus a five-way toggle switch for LFO waveforms (Sine, Saw and Square). A Tap Tempo footswitch, True Bypass and Buffer Bypass, plus integrated BIAS pedal software for pedal design, preset management and hardware customization all come standard. This Cyber Week, with your purchase of select Positive Grid Bias amps on Sweetwater, you can get a free Twin Pedal of your choice for free! To take advantage of this sweet deal, step right this way. 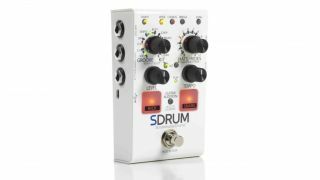 DigiTech's SDrum auto-drummer pedal is certainly one of the niftiest innovations in drum programming in recent times. Guitarists in need of a quick, steady backbeat can simply play a couple bars, and DigiTech's BeatScratch technology will build a full groove based on the user's performance. The pedal also features pads on the front panel, so users can manually input their own patterns. This Cyber Week, Sweetwater is offering buyers a $100 off this incredibly useful pedal. Normally a $199.95 value, the SDrum is available now for just $99.95. To save $100 on the DigiTech's SDrum auto-drummer pedal, point your browser this way.